This project started off with "I want to do something different".... so I hooked on some Black Simply Soft yarn and my groove was on... my hook was flowing with ease, no tension in sight... about 8" later I went another route and pulled out some White Caron Simply Soft yarn and played with a couple of rows, alternated between black and white. After a couple of rows, decided I did enough playing and continued working in white. In my mind's eye a project was slowly formulating and over a couple of days, I continued working this piece in the round in single crochet. A week later I went in search of crochet and knit magazines to inspire me and after looking at various mags that focused on fall wear... 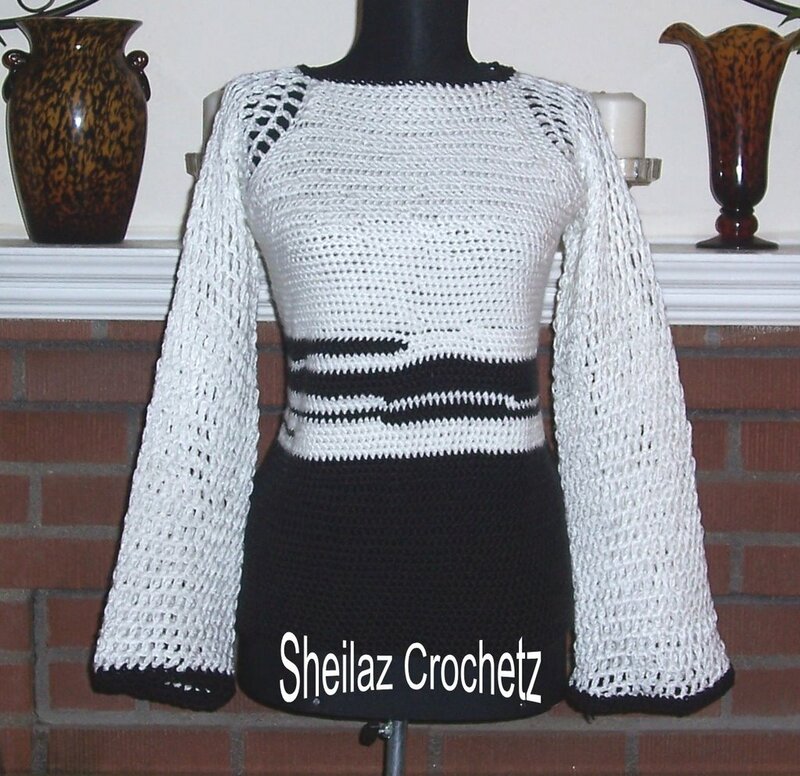 I decided I would do a pullover sweater... once I had completed the body of the sweater I wanted to add a twist and created the sleeves doing open stitch work... and a piece was borne. Gorgeous is all I can say about this!! Your work is so inspirational and creative.....love it!! This sweater is beautiful. I love the stripes and the raglan sleeves. I love the shaping and bell sleeves rock! Nice, and I really like anything done in the round--seemless and smooth. I like the way the stripes come together. great crochetting. What an awesome sweater!!! You're so talented! OH MY, how beautiful! And so very creative the way you came about it. You are just a busy bee. This is very pretty. Should get a lot of wear out of it. That is wonderful! You are very creative! It really is lovely! I love the colors.